Meet Nuon Nary and Keo “Toot” Touch. They’re your hosts for an enlightening cooking class in Battambang. You can read about this lovely couple and their modest little venture in my latest post for The Faster Times. Then take a spin through the photos here and consider booking a class on your next trip through the country. 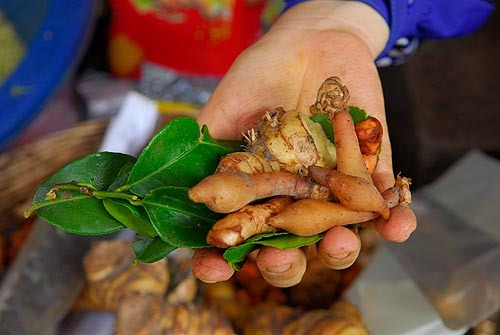 Toot will take you through the local market. Ask questions. 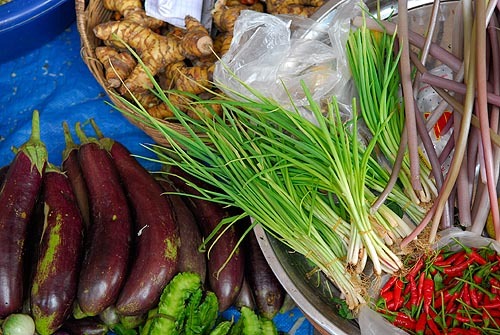 Ask him anything you want to know about Khmer food and culture. Tell him you want to know the truth. Tell him you’re not afraid of prahok. And he’ll share his world with you—not a sanitized, tourist version. 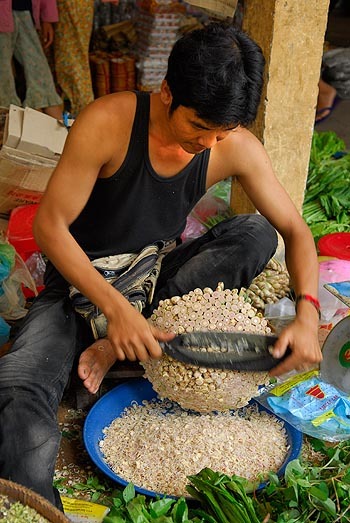 But the gritty down-to-earth realities of everyday life for Khmers, past and present. Then head to the kitchen with Nary at your side, and make yourself the most fragrant batch of amok you’ve ever had. It just might be the best 6 bucks you spend in Cambodia. 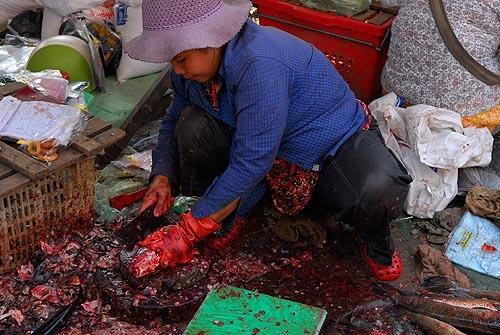 A Battambang vendor guts and chops her fish. Nary chops lemongrass in her kitchen. Nary cooks a batch of sour fish soup. Cool! Sounds awesome. I agree cooking classes are the best. 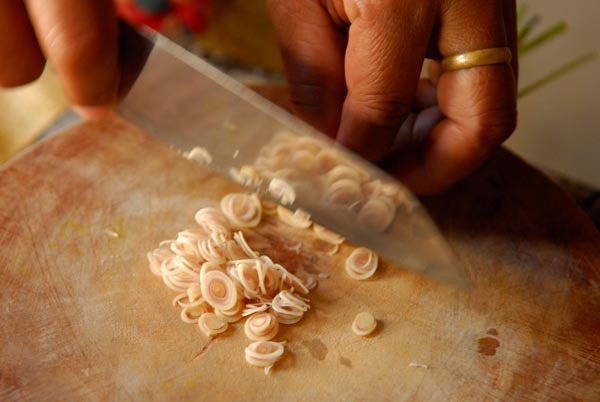 Reminds me of my cooking adventure in Siem Reap – check it out @zomppa! How funny, I just planted lemongrass *this morning*! It does really well here, in Oklahoma… but I doubt I’ll have as much as the man shaving it. Wow. Do you have any suggestions for a similar class in PP or close to PP? I know of the one on Saturday, but it would be great to have such a personal learning experience as you’ve described here. Thanks. Thank you for this, Karen. I’m going as soon as I get home and begin to feel bored with being in one spot again. Belinda, I like cooking classes because they often present great opportunities for talking at length with people who really love and understand their food. Sasha, good luck with your lemongrass. 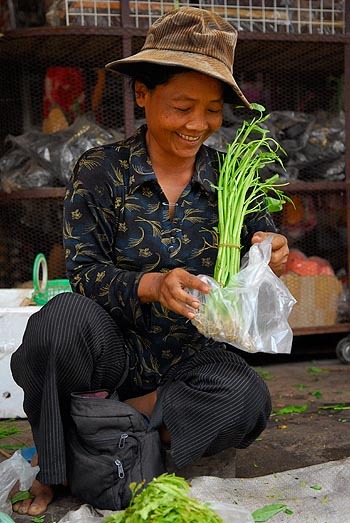 Since you’re growing it, you’ll also have the leaves (which are usually unavailable in Asian markets in the West). Those leaves give Khmer curry their rich green tint. Andy, I’ve never taken a class in Phnom Penh… you could check out Frizz. Janet, thanks. I’ve really come to enjoy Battambang in recent visits. I’ve had some rough times there, in the past, but the city has grown into something new. Karen, thanks for this cooking suggestion that looks great and is affordable. 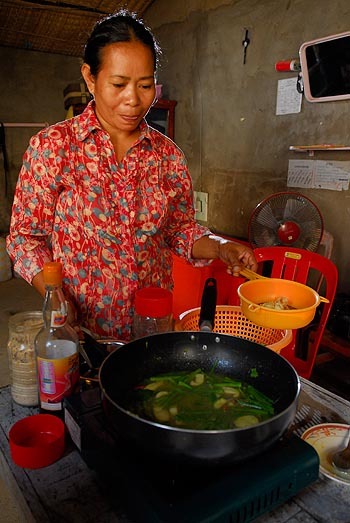 If I make it back to Cambodia soon, I would love to have a chat with Toot and learn a bit of cooking!